WHR has been breeding Border Collies and selling puppies for over 20 years. 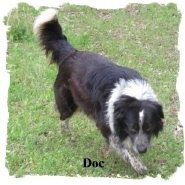 All of our dogs are ABCA registered Border Collies and out of "Working Stock". We are fortunate to have been able to maintain our bloodline from Maybell and Okee. We have found that pups from that line are very smart, healthy, and capable of excelling in areas of work or herding, agility, therapy dogs, frisbee, companions, or great family pets. We breed for quality, not quantity. We maintain no more than 3 breeding females. All of our dogs and puppies are kept up to date on vaccinations and deworming. They are handled daily and are fed twice a day. We strive to produce a dog that will excel in intelligence, disposition, and ability to work. With this as our goal, then everything else falls into place and the results are high quality puppies that would fit anyone's need. When Tootsie had her first litter of puppies there were some rare colorings of sable in the litter. I am adding a link to Bryning Border Colours so that you can read this information. You will be linked to Bryning Border Collies and at the end of the page is a picture of a Ghost Sable pup slide show from 1 month to 1 year of age and the color changes. 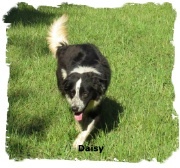 We purchased Daisy, a female out of Dixie ( a female out of our Mistee and Gremlin 6 years ago). We bred her to Pirate and she had her first litter in April 2015. Since Molly has been spayed, we have purchased Dill to fill that spot. She is on the petite side like our Maybell was. 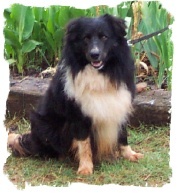 She is a black tricolor and is out of Zac (Sheep Herding Champion). Here is a video of Zac in the finals of the 2014 Sheep Herding Trials. 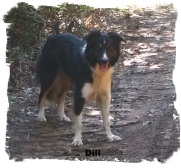 I am adding a picture of Dill below. Tootsie is a Seal with unrelated bloodlines. She was bred to CC and had 10 puppies in her first litter on January 3rd of 2011 with several of those being Ghost Sable or Seal colored because CC was the sire of that litter. We have just had Tootsie spayed. 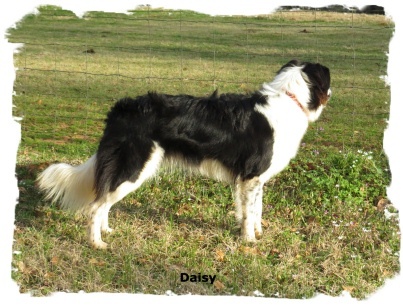 She produced some of the best dispositioned and colored puppies of any of our Border Collies. One of those pups, "Doc" Holiday was going to be one of our breeding males (pictured below), however, we have yet to get any puppies out of him.Sam is the "new kid on the block" and his first litter was awesome. Pirate is out of CC and Tootsie. We have had 3 litters out of Sam and Dill. We lost CC in January 2016 due to cancer. He was an awesome Border Collie and is much missed. 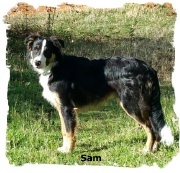 We did keep his son Sam, who is a black tricolor. 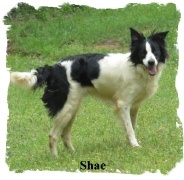 We have added a new female to our breeding stock and that is Shae. She is out of Molly and Pirate. She will be bred to Doc when she comes into heat.